I've been feeling a bit stuck in a rut lately, and haven't had much inspiration for painting (theres some pretty funky primed builds standing around on my desk but they deserve the proper enthusiasm ) . That said there's been a lot of playing around with bits, but not much has come of it. I might actually have reached the point where I have too many bitz... Constraints can be liberating you know. It really fits with the original concept and the evil dead reference is brilliant ! This one shouldn't be too hard to get painted ! One quetsion, where does the padded jacket come from? I was looking for some and idn't find any, what sprue dies it belong to? 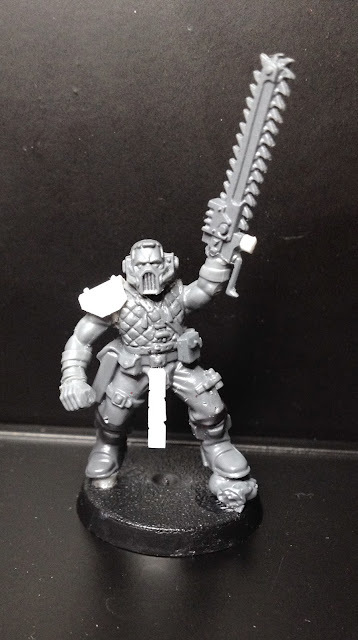 The torso is from the old mordheim/empire militia sprue. That's awesome, dude... but where's his "boomstick"? I normally don't do blood spatter as I sometimes find it a tad " juvenile". But this might very well be an exception. Listen up you primitive screwheads!